132 Michigan State held Ohio State to just 132 yards of total offense, the lowest amount by any offense coached by Urban Meyer in his 14-year career. The Buckeyes accumulated just 75 yards in the first half, their second lowest total in a half since 2004. The Spartans' defense eliminated big gains by Ezekiel Elliott, whose FBS-best streak of 15 games with 100-plus yards ended. To add to its impressive win, Michigan State has now won both of its rivalry games against Michigan and Ohio State without leading until the final play. Mark Dantonio is now 6-1 in his last seven games against top-10 opponents. The Spartans snapped the Buckeyes record 30-game Big Ten streak, who also entered the game winning an FBS-best 23 straight games. 6 Vernon Adams Jr. blew away the USC defense on Saturday with six touchdowns, the most the Trojans have ever given up to an opposing quarterback. It also tied the school record for most touchdown passes in a single game. The quarterback extended his personal streak to 34 games with a touchdown pass. Adams averaged nearly 35.7 yards per touchdown catch and completed 20 of his 25 pass attempts for 407 yards. If it wasn’t clear the Ducks missed Adams while he was injured, then it is now as Oregon has scored 44 points or more during its last five games. 11 Baylor won for the first time in Stillwater since Oct. 7, 1939 with its 45-35 win over Oklahoma State. The Bears snapped their 11-game losing streak on the Cowboys' home turf, thanks in part to big plays from quarterback Chris Johnson down the stretch. The sophomore entered the game in the third quarter following an injury to Jarrett Stidham and right away made an impact with a 39-yard pass for his first career passing TD. Johnson followed up with a 71-yard touchdown pass on his very next attempt. The 3rd-string QB would finish with 138 yards and completed five of his 10 pass attempts for a 27.6 yards per completion average. 51 South Florida set the school record for most points in a half with its 51-3 halftime lead against Cincinnati. The Bulls scored touchdowns on each of their first four possessions and took only five minutes and 47 seconds off the game clock. The Bulls' 27 points in the first quarter was one point shy of the team record for points in a quarter. But USF would tack on 14 more points to win 65-27, which was the most points against an FBS opponent in program history. 389 Christian McCaffrey lit up the stat sheet with his 389 all-purpose yards against California, which set the single-game school record. McCaffrey recorded 148 yards on his kickoff returns, 192 rushing yards on 29 carries and topped it off with a 49-yard touchdown catch. 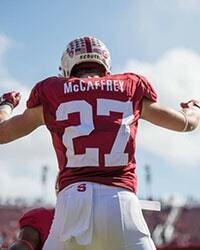 McCaffrey leads the nation with 255.2 all-purpose yards average per game. His efforts on the field haven't gone unnoticed by award committees, either, as McCaffrey was named finalist for both the Maxwell Award and Doak Walker Award. 550 Dak Prescott became just the second player in SEC history to top 550 yards in a single game, joining former Texas A&M quarterback Johnny Manziel. 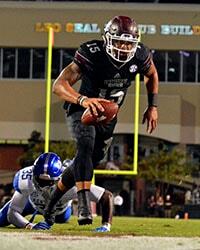 The quarterback combined for seven touchdowns and 554 yards in the Bulldogs' nail-biting win over Arkansas. Prescott's total yards were more than 13 SEC teams had in Week 12. The quarterback also became just the second in SEC history and fourth overall in FBS to throw for 60 touchdowns and rush for another 40 in his career. He joins Central Michigan's Dan Lefevour, Florida's Tim Tebow and Nevada's Colin Kaepernick.